Perfect to use in your car, office or home, this deluxe cushion provides a soothing massage without an expensive spa visit. Simply use the remote control to select the intensity, massage region and type of massage you prefer – pulsating, tapping, rolling, kneading or a combination of modes. 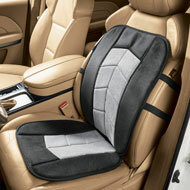 The heat option will generate gentle warmth to enhance circulation and help you relax. Polyester fabric can be spot cleaned. 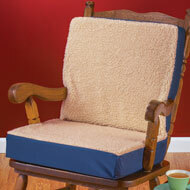 42 1/2"L x 19"W.
Now you can sit comfortably and enjoy added support with this cozy chair cushion. 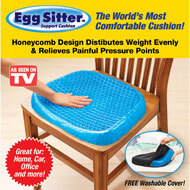 The plump polyfill inside helps provide extra support, relieve pressure, and adds comfort to your arms, back, and seat. 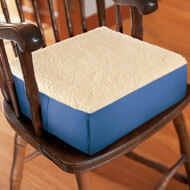 Perfect for use in any type of chair, this versatile cushion is available in blue or burgundy. Spot clean. Polyester; imported.  49"L x 49"W x 2 3/4"H.
Great for home, office or car, this comfortable foam cushion swivels 360° to make it easier to get in and out of chairs and car seats. 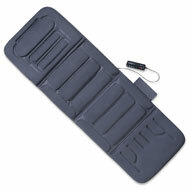 Lightweight and portable, it has a removable, machine washable cover. ABS, polyester and foam. Measures 15 1/3"Dia. x 2"H. Supports 330lbs. 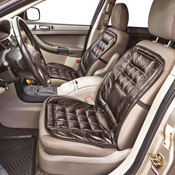 Enjoy the ergonomic comfort and stylish good looks of this genuine leather seat cushion. 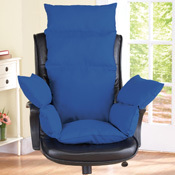 It has builtin lumbar support and luxurious quilted padding to support your back and promote proper posture so you can sit comfortably for hours. Perfect for home, office or car, it features elastic straps to hold it securely in place. Genuine leather with a PVC backing. Sold individually. Seat is 17 1/2"L x 19"W; back is 21 1/2"L x 19"W.
Now you can enjoy extra comfort and style with this memory foam car seat cushion. 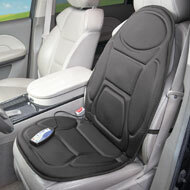 The extra padding helps you sit comfortably while driving or sitting on a hard chair at home or in the office. Simply slide it over the seat, and the elastic straps hold it securely in place. Spot clean. Polyester and sponge; imported. 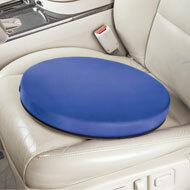 Measures 36"L x 15 3/4"W.
Enjoy the comfort and stylish good looks of this velour car seat cushion. 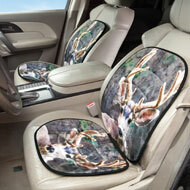 The soft fabric features detailed images of a handsome deer. Perfect for home, office or car, it features elastic straps to hold it securely in place. Machine wash, air dry. Polyester, PVC, and polyfoam; imported. Seat is 21 3/4"L x 17 3/4"W.